Select stacked bar chart after uploading your data. In this step, you can further enhance the appearance of the chart. Plus, there are some small tricks - such as showing how many people did not answer at all visually (as in the example below). Let us show you how to make a beautiful stacked bar chart in three simple steps. This guide will walk you through the steps necessary to create stacked bar a bar chart as seen above. Labels: Select the column header that contains labels for each row. 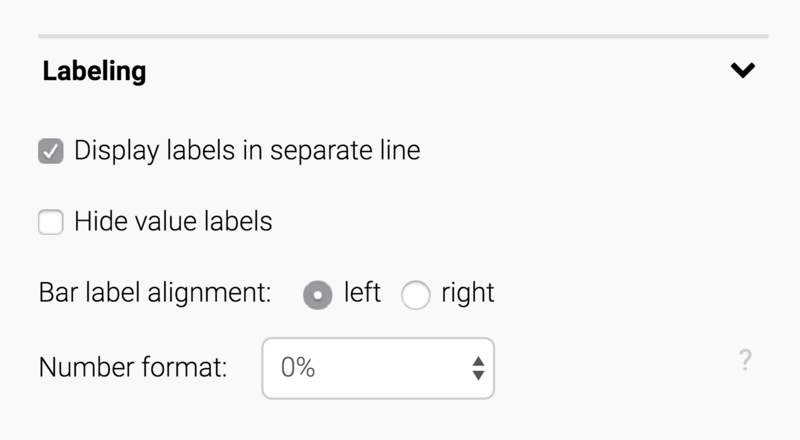 These labels are in your category-column. We'll choose the column "Topic" as our labels. Groups: You can upload an extra column to put categories into extra group. In our case, we could have a column that states for each topic if it's been reportedd in the "first half" of 2015 or in the "second half". If we chose that column as our "Groups", the chart would make a separation between the bars. Since we only have four topic, we won't group our data. In this panel, we have just one decision to make: How should the bars and their labels be sorted? You can keep the order of your spreadsheet with selecting "keep order". Or you can sort your charts by one of your columns, e.g. "Low Trust". The biggest value in this column will then be at the top. If you'd like to have the biggest value at the top, choose "ascending". Under " Labeling", you can decide the overall look of everything text-related in your chart. Make sure that the number format is the one that represents your data best. For very high numbers, choose "123k" or "123.4k"; for percentages, choose "0%". 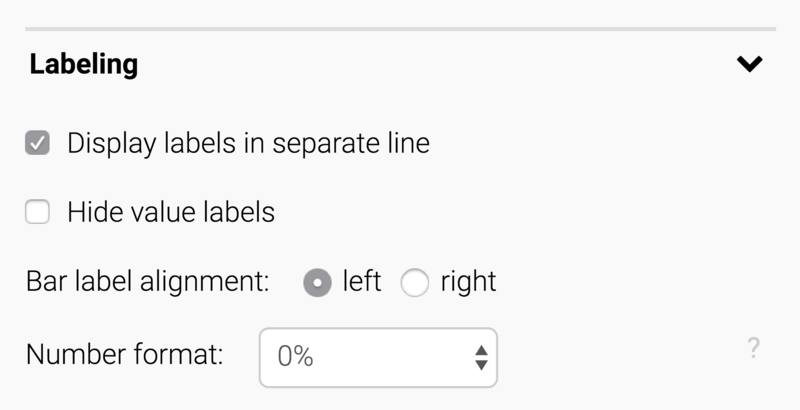 In the next panel, we can make some display decisions that are rather self-explanatory: Do we want to display the labels in a separate line? And do we want to hide the value labels? Display grid lines? Feel free to play around with these settings to see what works best for your data (don't worry, you can't break anything – just uncheck the checkbox again if you're not happy with the setting). In the fourth and last panel in the tab "Refine", we can decide the design of our bar chart: We can choose bar colors and decide if we want to separate rows with a line, make our bars thicker or stack the percentages. Let's focus on how to choose colors for our bars. 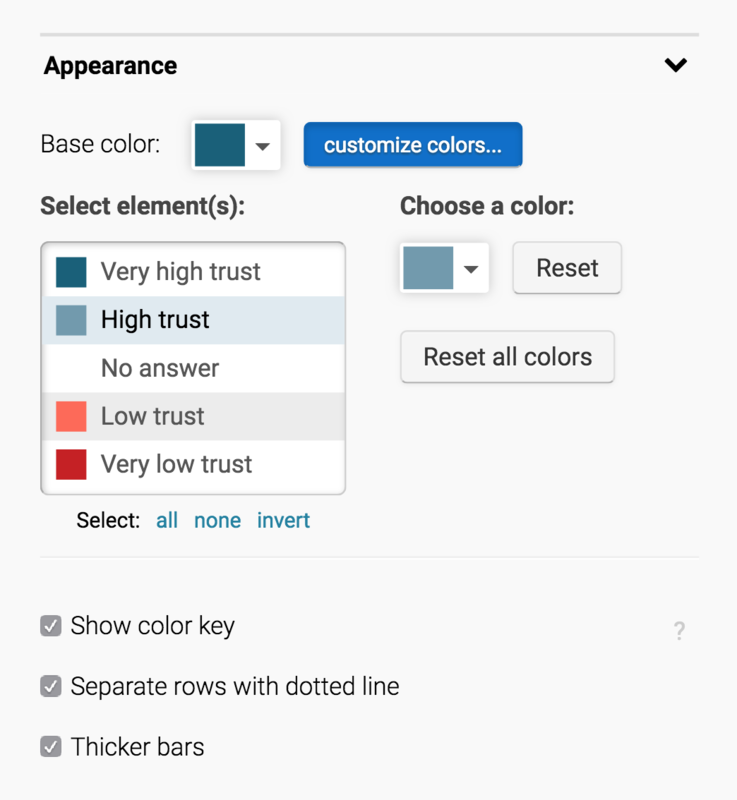 We can choose one color for all our bars (click on "Base color" to change the default color). We can also adjust the colors manually. This will help us to make the stacks more distinguishable. To do so, click on "customize colors" next to the base color. By choosing a light grey for "No answer" we create a blank space. This is a valid visual option helps make clear that a certain proportion did not answer at all. This little visual encoding trick gives the chart a nice touch. We use color saturation to categorize our measures. In this case: The more affirming the answer, the greater the saturation. Choose a color that is easily saturable! If you're working with surveys and have two opposed extremes like "Disagree" and "Agree", we recommend the following: Tone down the Neutrals and the Don’t knows , and tone up the extrema to make them more clearly stand out. Below the "Appearance" panel, you will find a “Stack percentages (normalize values to 100%)” checkbox. That means you can upload absolute values (“350 people liked it, 150 disliked it”) and then convert it to percentages directly in Datawrapper (“70% liked it, 30% disliked it”).